It was a perfect New England summer day: sunny and bright with a smattering of white puffy clouds in the cerulean sky. The warm temperature was complimented by a sweet, cool breeze that ruffled my hair playfully as my son and I walked into the airport. We were uncharacteristically early…but it was the first time I have ever put my child on a plane unaccompanied, and I wanted to make sure I didn’t run late and make any mistakes, like accidentally send him to China instead of Baltimore. I won’t lie. Mistakes were made. Although luckily nobody ended up in China. One day, a few months ago, my husband told me about a horrible thing called Travel Lacrosse. At the time, it sounded innocuous: practice 1-2 nights a week, a few tournaments, the opportunity to play his favorite sport at an elite level…how could I say no? Many of you mothers reading this are shaking your head at my naiveté..I am a fairly well-educated woman (as you can tell by my use of the word “naiveté”), how could I have been so foolish? Didn’t I realize that practices would be held during rush hour on the far side of town? That I would have to walk my son through a mosquito and toad-infested park in 97% humidity to get to the lacrosse field? That on the last day of school, I would spend 7 hours crawling up I-95 on the way to scenic Boonton, NJ, muttering obscenities at my GPS as my children looked on in askance from the backseat (“Why is Mommy saying so many swears?”) to watch my son’s team lose. Every. Single. Game. And for the privilege of all this, that I would pay $700.00 in fees? “So, you saw my email?” Eric asked me as he loaded up his plate with meatloaf. “Well, what do you think?” he asked. I chewed thoughtfully for a moment. “What do YOU think?” I asked him back. “He’s a good lacrosse player, and the coach seems like a great guy. There’s some weekend travel involved,” he said. Aha! I nodded my head sagely. “Of course, that’s why it’s called…. “Travel Lacrosse?” I guessed. In the end, we decided to go ahead with it..mostly because our son, Danny, is a bit like a puppy. Sweet, good-natured and happy when he is well-exercised. When he’s not, he’s bound to chew through entire bags of marshmallows and break a lot of stuff. Eventually, I did read the email, and was dismayed to see that two of the tournaments conflicted with our long-scheduled trip to Cape Cod. With a tournament the first and second weekend of our trip to the Cape, we would have to shorten our stay from 8 days to four, which was unacceptable. It takes a whole day just to get over the fast food hangover from the drive up! I was not about to allow this beast called Travel Lacrosse to screw up my vacay plans. And so, I thought outside of the box and made a daring decision: if Danny is old enough to travel to various other states to play lacrosse, I reasoned, than surely he is old enough to fly unaccompanied. And so, on that gorgeous Friday morning, I farmed out my oldest son and younger daughter to helpful friends, left the Cape at 8 AM Friday morning and drove to the airport to put Danny on a plane to Baltimore, where my husband would meet him and drive him to the tournament in Williamsburg, VA. This may sound needlessly complicated and expensive to many of you whose children are not involved in elite sports. You have to understand, these are the sacrifices we make to watch our children lose game after game (thank goodness for the mercy, or “slaughter” rule. Maybe “elite” is a stretch…perhaps “enthusiastic” is a better adjective.) Plus, thanks to the thousands of dollars of sports equipment and team fees on our Southwest Visa card, we were able to get the ticket virtually for free (or for 300,000,000 points). At first, everything went beautifully: We found a parking space, checked in, got through security, and got to the gate without incident. I put an excited, happy Danny on the plane and watched the aircraft soar into the sky (well, I was actually reading on my kindle, but I totally asked around to make sure it took off okay). As I strolled back to my car, I wondered what I had been so nervous about! Smiling, thinking about the the relaxing day ahead, I reached my car door and waited for the “beep-beep!” and clicking noise as the door unlocked. I stood in front of my car door for a moment, staring at it accusingly. “Where is the “beep-beep?!! !” I wondered. I tried the handle. Locked. Peering through the window, I confirmed that it was, in fact, my vehicle. The donut crumbs and sticky ice cream covered spoons could possibly have belonged to some other slovenly family, but there was all my luggage, locked in the trunk. I emptied out my purse. Maybe the fancy key fob had malfunctioned. They HAD to be in there. I had my phone, although it was currently at 24% charge. I had my purse, with money, chapstick, and various club cards and coupons that, in a pinch, I could barter for food and/or shelter. I also had shoes, the clothes on my back, and a pack of gum. Not too bad, all things considered. For the next two hours, I did that in excruciating, repetitive detail. I looked around my car, under my car, around and under the cars around my car, around and under THOSE cars, slowly retracing my path back into the building, through security (and yes, I know what you’re thinking, I was that annoying lady who bypasses the queue at Security with a sob story and earns the instant hatred of all 200 people in line.) I followed my entire path to the gate in reverse, the whole time berating myself for being so careless. Why, oh why, had I downloaded that most excellent, totally engrossing novella before Danny got on the plane? Why had I read it while I walked back past Security, went to the ladies room, washed and dried my hands, and gone on the people mover? Just because I’ve long since perfected the art of reading while walking, due to many years of practice and my freakishly accurate peripheral vision, doesn’t mean I SHOULD do it! It’s like a superpower that I used for evil instead of good. I probably left my car keys dangling somewhere because I was so focused on the wicked games in the ebook “Wicked Games.” (It’s really good, though- you should totally download it after you read this). And, to be fair, he did. Miraculously, he found an employee in the Southwest Cargo Department who, for $60, put them on a plane bound for Boston. I only had to wait until they arrived at the Cargo desk at 7:00 to pick them up. From then on, the day was gravy. I discovered a place called “Dine Boston,” where I blissfully sat and devoured a delicious turkey club sandwich with sweet potato fries, a pint of Allegash and, to reward myself for my strength in the face of adversity, a giant mint brownie a la mode. I was in a much better mood afterward, and used my new supercharger to download some more excellent ebooks to pass the time while I waited for my car keys to arrive. “Wicked Games II?” Don’t mind if I do! 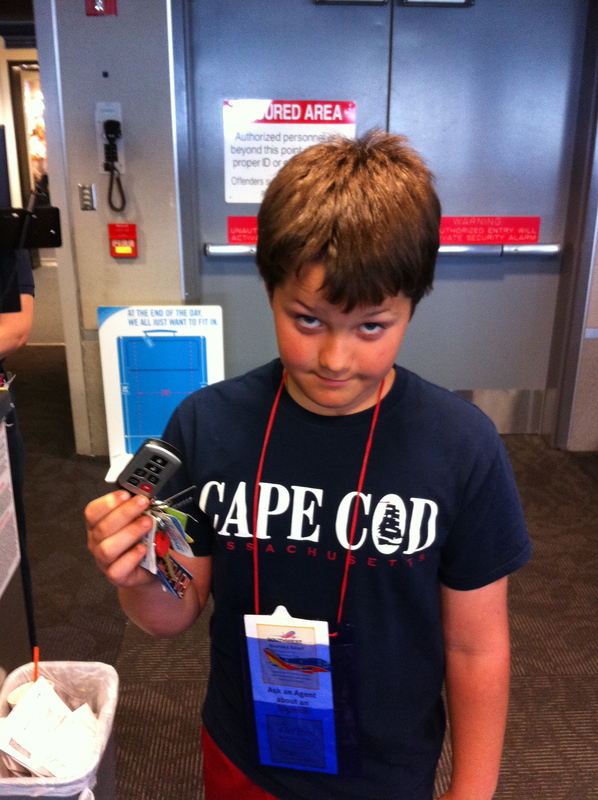 Many of you are wondering just how the keys ended up on the plane and hoping for a explanation in true “Encyclopedia Brown” style. Sorry, that’s the keys’ story. You will have to wait for the movie. Or at least the next blog installment. And by the way, Danny’s team won exactly one game at the lacrosse tournament. Hi Kristi! That’s a tragically awesome piece of writing! You are a gifted writer. I think you should pursue a career in TV sitcoms. I think you have the material to create a show similar to Seinfeld but in family format. $$$$ Something to think about! Thanks for reading and posting, Melinda! Eric and I have talked about how we are often funnier than most TV sitcoms.. we really are our own biggest fans. LOL. Please remember me when you become famous and I come to your book signing. I wlll not only remember you, I will sign your forehead if you ask me nicely. xoxo. I miss you too much. Absolutely hysterical to read! Best part was being able to picture your face (and Eric’s) through the whole timeline! 🙂 Love it! Kristi, I love reading your blogs!!! Miss you!! !